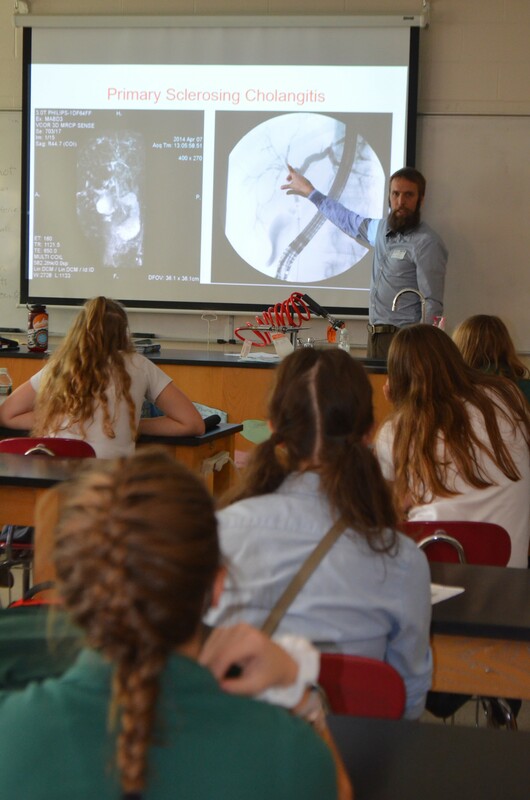 Last May, the Anatomy teacher from Bishop Guertin (Derek’s alma mater) asked us if we’d be willing to come speak to the Medical Professionals club in October. We’ve never received such an advanced request so we of course said yes and then promptly forgot about it until she emailed Derek last week to remind him of the date. Luckily, this wasn’t our first rodeo so we were able to whip up a presentation lickety split. 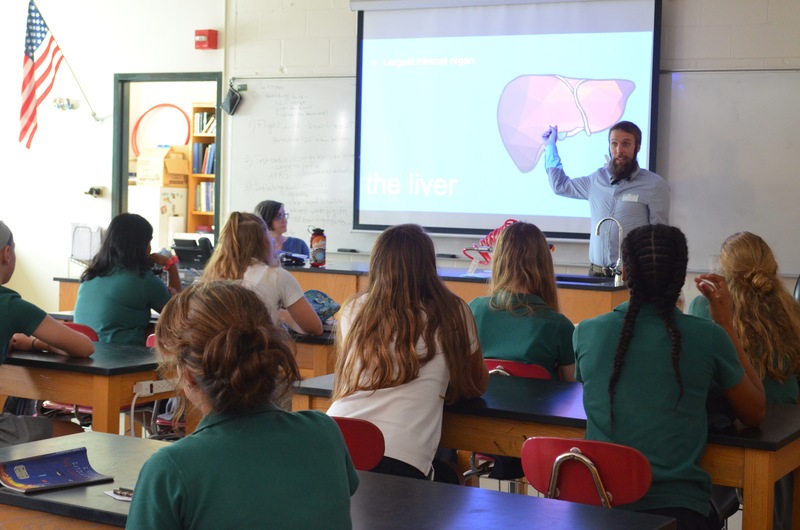 We had a full classroom of students, from Freshmen to Seniors and they gave us their undivided (mostly) attention as we told them all about our favorite organ and the wild ride Derek’s former liver took us on. 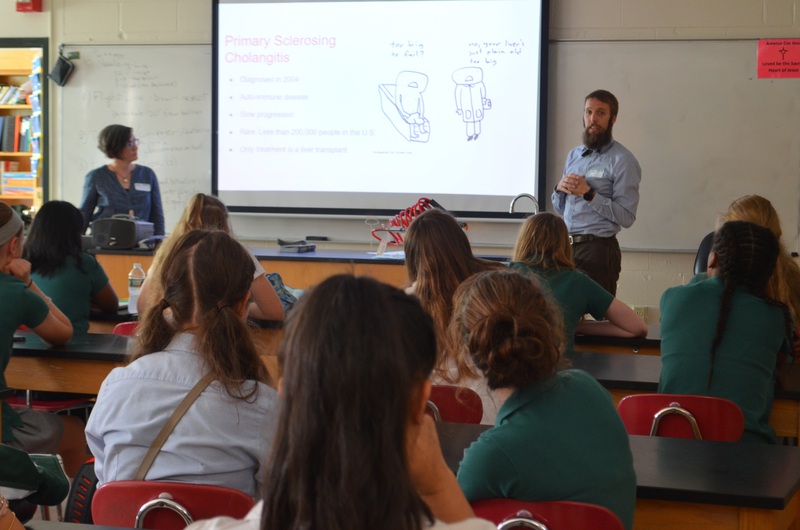 They laughed at a couple of our jokes, which was encouraging, and then asked thoughtful and interesting questions about transplantation: Why don’t they transplant large intestines? Do you have to be careful when other people are sick? Will Derek be able to donate his other organs after he dies? What are the risks of being a living liver donor? 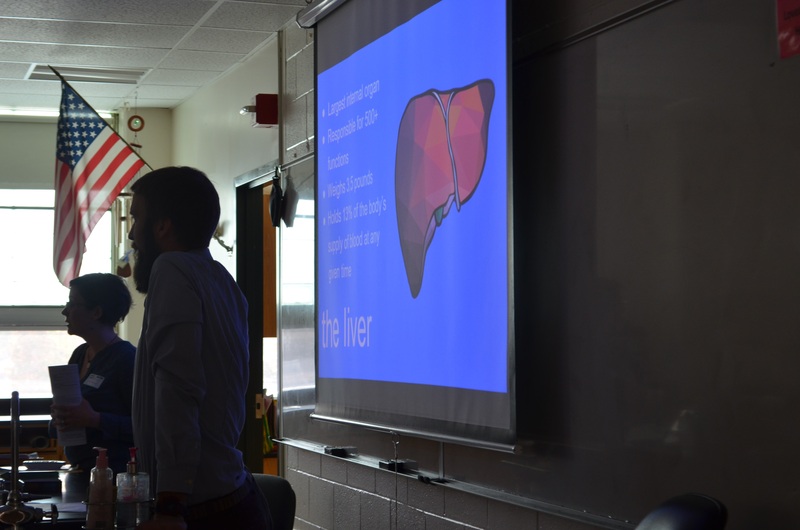 This is a group of students who are interested in pursuing a career in medicine and we made an impassioned plea for them to consider being hepatologists because we are shameless in our love of the liver. The school posted about our talk on their Facebook page and several teachers in the hall treated Derek like an alumni celebrity. After the talk one student came up to ask me if I had any advice for someone about to have surgery, and boy oh boy did I. She mostly seemed scared that she wouldn’t be able to do her homework on Friday after her procedure to fix a tendon in her ankle, and I told her to maybe just take care of herself and not worry too much about the homework. Mostly I told her to prepare for surgery as if it were a dance recital or a big game: try and relax the night before as much as possible, drink a LOT of water, start eating easy to digest foods now, and most of all be good to yourself. Which brings me to my announcement, I’ve been thinking a lot about our transplant story lately because I recently gave my notice at the radio station in order to try to finally collect all of the scattered writing I’ve been doing about our experience into a book. Quitting my job cold turkey was a big leap for me, but I’m excited to give myself the chance to put my whole brain into this process. In a few weeks I’m traveling to D.C. to attend a conference on how to be a liver health advocate and do some research for the book. Meanwhile, I may start posting here with a bit more frequency, I’ve got a few things in mind, but if any of you faithful readers have requests for posts, I’m all ears. Oh! One more thing, I’m in the process of revamping the website, so hang in there while I get it just right. Thank you Mary! Not to worry, you are a lifetime member of our email list. Yay! You’re writing a book! I can’t wait to read it! Congrats on the big move! 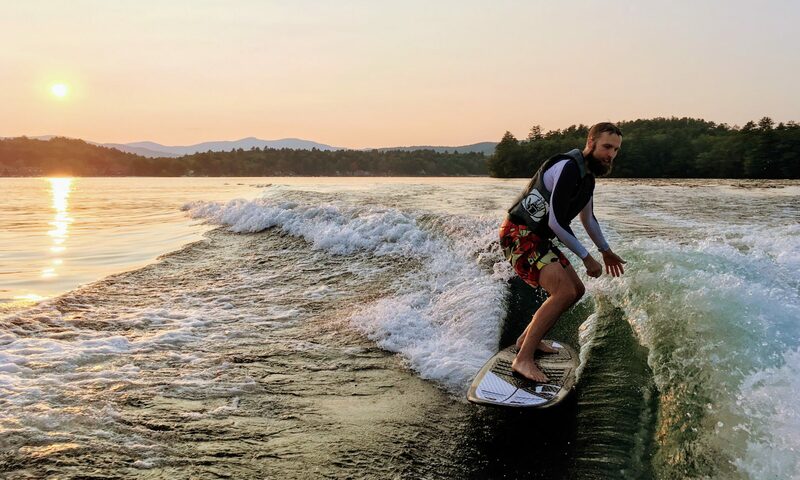 Good luck on this new endeavor, Logan! Logan, I’m thrilled for you and look forward to hearing and reading about your new adventures! Best of luck! Thank you! I’m pretty excited too! This is awesome. We are cheering for you!!!! Also, Logan, please carve out time to think about the style you want for your author picture — for the inside book jacket. Oh absolutely. I really like the ones where the author is at a very strange diagonal angle sort of leaning towards the camera, and the lighting is real real soft and maybe I’ll take my glasses off and nibble on one of the temple tips? Great to hear from you guys! Glad you’re doing well. Been following you guys throughout the entire journey. You’ve got a winsome way of writing…… a book would be great. ( Derek knows Heather, my sister, from BAE). I will never turn down encouragement, thank you Lisa!